Celebrate the coming of Christ. Celebrate Incarnation. Celebrate Emmanuel. May this completed Advent be the start of a fresh, new journey with Jesus for the coming year, an unfolding experience of Emmanuel. Advent morphs into Christmas. The #AdventWord calendar is now the swaddled babe. The Advent tree becomes a Christmas tree. Equipped with the skills of Advent we become Christmas people, followers of Jesus—laying the groundwork and working for the emerging kingdom of God. I wrote this post for the website Building Faith, a ministry of Virginia Theological Seminary to offer practical resources for the Christian formation of people of all ages. It was first published on December 11th, 2015. For Christians, the above three-sentence story is the essence of our faith: Christ’s victory over death and the promise of his return. Some Christians say these words every time they share bread and wine in the Holy Communion. Even small children can recite and remember these words. Three-sentence stories are one of my favorite ways to order muddled thoughts. As a Christian formation tool, they give adults and children a safe and playful framework to organize and express ideas. I use 3-sentence stories in workshops and retreats, often as a way for people to summarize what they heard from a passage of Scripture. The stories can be oral or written. To teach the 3-sentence story form to children, start with a concrete, oral version. Ask them to describe the clothes they are wearing or what they ate for breakfast this morning. Give an example. I ate one fried egg with a runny yolk. The toast was too dark and crisp. My coffee had cream and sugar in it. Three-sentence stories can be written as a private practice, but as a group activity they build community. Try 3-sentence stories in a family setting, a Christian formation class, an Adult forum, a church school class, or youth group. In my experience most people love to read their stories aloud. The collective result feels like a playful and powerful poetry jam. Because the stories are short, many people get to share. We have purple candles in our wreath. Purple is the new Red. Like a traffic light, it signals STOP, wait, pay attention. Mary was a Jewish teenager. The angel asked if she would be the mother of God’s son. In Advent we often talk about the word Hope. Write a 3-sentence story about what you hope for. I hope for great schools and great healthcare for everyone. I want to see older people have more choices for their lives. I hope God will help me become a less judgmental person. Proclaim Christmas in Three Sentences! Christ will spread like wildfire. 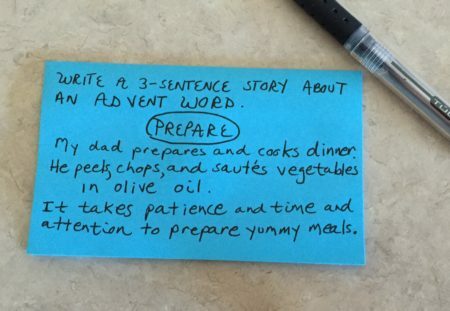 What is your 3-sentence story for the Nativity Season? Today is the last day of Christmas and it seems there should be some appropriate greeting or words of benediction for this day. I’m trying some greetings on: “Godspeed Christmas” or “Merry Twelfth Night” or “Spread the Light of Christ” or “Glory to God in the Highest.” The last sentence works for me. These words are on my friend Carleton Bakkum’s wonderful paintings below. He calls this his Garage Art. I think it’s more like Cathedral Stained-Glass Window Art. For some people Christmas is long gone, with ornaments packed away and hints of Valentine’s Day making their appearance. I am way too much of a Nativity Season extremist to let go before January 6. And I’m hoping to grasp some moments of stillness and prayer in a Christmas setting before it is over. If you are looking for some Twelfth Night activities or closure for the Christmas season, here are a few ideas. * Carleton’s art is acrylic on wood cut-outs. 4 and calling together all the chief priests and scribes of the people, he inquired of them where the Messiah was to be born. 7 Then Herod secretly called for the wise men and learned from them the exact time when the star had appeared. The website Patheos–Hosting the Conversation on Faith addresses all religious and non-religious spiritual paths. It seeks to be a place where people ask questions and discussions take place about all world religions and even atheism. One of their divisions is The Patheos Book Club. For the first two weeks of November The Season of the Nativity is one of their featured books. There are reviews by bloggers, a Q&A about the book, an article by me called “Five Ways to Experience an Extreme Advent,” and a video interview with Deborah Arca (a managing editor of Patheos). When I found out that Deborah not only has a theology background but is a jazz singer I suggested we sing the “Advent Chant” by Phil Porter form page 90 of the book. She agreed and we did. The Advent Chant starts about minute 16:00 of the the 18-minute interview. Here is the link to all of the Patheos Book Club Season of the Nativity entries. Please pass this on. Thanks. Just thought I’d be the first person to review the book. A little serious, a little snarky…. After four books about the doodling prayer form she calls Praying in Color, Sybil MacBeth is traveling on a new path to God. Besides prayer, MacBeth is passionate about the Nativity season. Her latest book, The Season of the Nativity: Confessions and Practices of an Advent, Christmas, and Epiphany Extremist, is an invitation to join the ancient journey of Christmas celebration via some fresh ideas and some extreme practices–both spiritual and earthy. This is an odd little book. Odd, because like MacBeth’s mind, The Season of the Nativity flits from room to room. There is a bit of memoir, a bit of faux brain science, some front-porch theology and lots of great hands-on ways to celebrate Advent, Christmas, and Epiphany. Like the mismatched patterns of a Matisse painting, vividly contrasting sections of the book meet like striped and polka-dot walls in an impressionist still life. The book moves from fun, almost frivolous holiday practices to reverent and contemplative devotions in just a couple of pages. Praying Scripture, sprinkling purple sugar on ice cream, creating a prayer wall, staring at the stars, doodling on Advent calendars, and sleeping under the Christmas tree are just some of the varied ways it honors both the playful and serious side of the human spirit. This is also an imperfect book. Imperfect, because MacBeth clearly has a preferential option for purple and more pages are dedicated to Advent practices than Christmas and Epiphany ones. But although it is a little purple-heavy, many of the suggested activities for Advent can be used during the other two seasons as well. And besides, MacBeth has been in love with Advent for a long time. She has only seriously courted Christmas and Epiphany in recent years. People of deep faith will appreciate this book, but so will those who struggle with faith and are unsure whether they can actually have a relationship with God. People who want to explore the Christian story can study theology or read history, but The Season of the Nativity gives readers the chance to immerse themselves in some of the stories and practices of Christian faith. MacBeth invites the reader into participation rather than insisting on a set of dogmas. Amazon ratings and Richter scale numbers aside, The Season of the Nativity is a book to shake and shift holiday celebrations. It does not promise to end the chaos of the season but offers to moderate it with meaningful and creative practices. Readers who follow the author’s suggestions for the three seasons just might make some new or revised affirmations of faith at the end, not because of coercion but because of lived experience. Or they may just have a one-of-a-kind, not-to-be-repeated Nativity season adventure. My new book, the Season of the Nativity: Confessions and Practices of An Advent, Epiphany, and Christmas Extremist, is now available. For years I have wanted to write a book about Advent because it’s my favorite season of the year. But Advent, I realized, is not a stand alone season; it’s part of a bigger picture. It’s the left hand panel of the Nativity Season triptych with Christmas in the middle and Epiphany on the right. Advent, Christmas, and Epiphany witness to Jesus’s presence on earth, to his flesh and blood self. This new book aims to give the Nativity season the attention it deserves. It celebrates Advent, Christmas, and Epiphany with a little theology, a little memoir, and lots of hands-on, head-on, heart-on activities for an individual or a whole family to do at home. Check out my new Home Page and the Season of the Nativity Page on this website. The Season of the Nativity Page has some mini reviews and links to where you can buy the book. Think Halloween and Thanksgiving gifts! Please Share with others via the Facebook, Twitter…buttons below. Thanks. Here is my friend Cindy O’s calendar. © 2016 Sybil MacBeth. All Rights Reserved. Website by Paraclete Web Design.